EAT designed Petit's power supply in a way to enable the tubes (two 12AX7 double triodes) to stay "hot" at all times, ensuring that they perform at their maximum during the entire listening session. The power supply, also, allows for a very high anode voltage for the tubes, allowing them to operate well within their linear range, the company says. The preamplifier uses hybrid design, featuring very special, low noise 2SK209 J-FET transistors in a quad-setup, offering quite an impressive signal to noise ratio at 87dB(A), and 70dB (20Hz-20kHz). The company says that no other tube phono preamplifier on the market is even getting near those results. 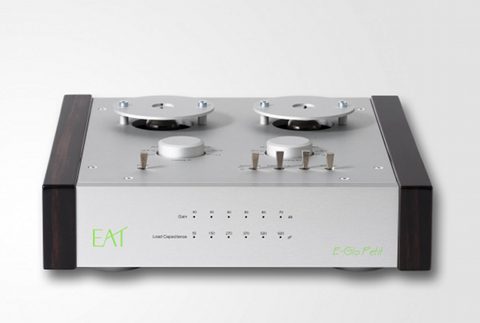 E-Glo Petit can be used with both moving magnet and moving coil cartridges and is highly adjustable, offering 6 different gain settings, between 40 and 70dB, eight input load settings, between 10Ohm and 1200Ohm for MCs and 30 Ohm and 75kOhm for MMs, and six load capacity settings, between 50pF and 620pF. There is, also, a subsonic filter (20Hz, 18dB/oct). The preamplifier features one single ended input and one single ended output, via RCA connectors. RIAA accuracy is within 0.1dB (20Hz-20kHz) and THD 0,15% (at 45dB gain). The E-Glo Petit is available with wooden side panels in two finishes, piano black and Macasar.